I know you are interested in healthy eating and natural healing like I am because you are reading this newsletter or Blog. But are you guilty? Even though I eat organic, natural, whole foods, I sometimes eat the wrong ones for my body type or I eat too much. 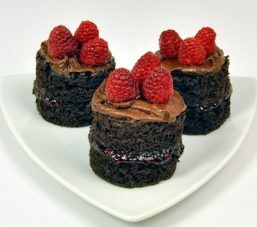 It’s not easy to say “no” to an organic chocolate cake with fresh raspberries and cream! Or how about a few pieces of the freshly baked parmesan-pepper bread from the local co-op bakery baked on stone ovens? Stressing your digestive system by overeating and causing it to overwork at each meal. Lowering your immune system response by eating a diet high in sugar. Natural products are often high in sugar and even organic, raw sugar is still…sugar. Raising the acidity levels in your body by eating an imbalance of acidic and non-acidic foods. A lot of people get so focused on eating organic whole foods they equate these foods with nutrition. However, nutrition is a more complex subject. Becoming educated about all the aspects of nutrition is the best gift you can give yourself, your family and your friends. I would also like to share my favorite digestive-weight-loss tea recipe with you. This recipe is one I use often to provide my body with more nutrition (so it feels full more readily), to help my body digest (even foods I may be sensitive too), to prevent bloating and give me more energy (so I’m less likely to want to turn to food for an energy boost). Let the herbs steep in the water for 15 minutes and then drain out the leaves and flowers. Drink up to three times daily. Don’t drink it within one hour of sleeping or you may need to visit the bathroom more often than you want to at night.